Take a closer look at the Library’s past. Click on a date to learn about Library history. 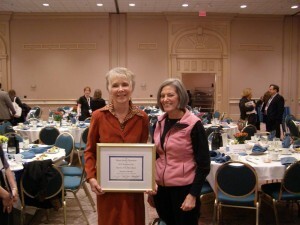 The first Library was established by the Mount Prospect Woman’s Club. Consisting of one tier of shelves holding about 300 books, the collection was located in a one-room schoolhouse on the corner of Main Street and Central Road and was staffed by volunteers from the Woman’s Club. 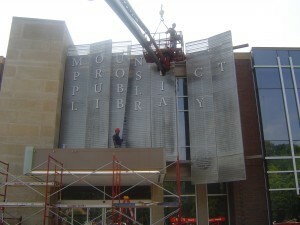 The Library moved to the old Mount Prospect State Bank building on the northeast corner of Busse and Main Streets. The Mount Prospect Woman’s Club was still in charge but employed Mrs. Irma Schlemmer, who was permitted to keep the Library open eight hours a week. 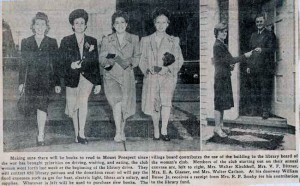 Woman’s club members canvass the village for funds to operate the Mount Prospect Public Library. From right: Mrs. Walter Kirchhoff, Mrs. V. F. Bittner, Mrs. E. A. Glaeser, and Mrs. Walter Carlson. At his home, Mr. William Busse, Jr. donates to Mrs. R. P. Smeby. From Illinois Digital Archives. A referendum enabling the foundation of a tax supported Village Library was approved. 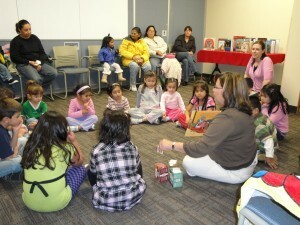 The young Library received assistance from the Chicago Public Library in the form of professional suggestion, furniture, and books. The Chicago Public Library also gave the Library 1,000 books for $200 per year, which it then returned to Mount Prospect to enable the purchase of children’s books. This help continued for twenty years. 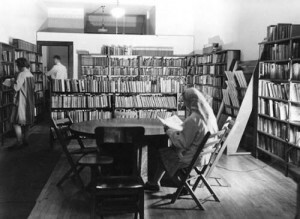 Interior of the building at 115 S. Main Street in 1944. From Illinois Digital Archives. The Library moved to a paint store at 115 South Main Street. Library board members and staff gathered for the library’s corner stone laying ceremony on March 31, 1950. 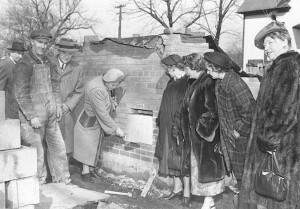 Show (left to right) are Maurice Pendleton (mayor); unidentified man (in cap); Ed Cleven; Dorothy Kester (with trowel); Ruth Carlson; Irma Schlemmer; Meta Bittner; and Bertha Ehart. From Illinois Digital Archives. 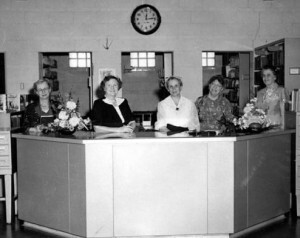 Library staff, circa 1950: (left to right) Ruth Carlson, Irma Schlemmer (head librarian), Meta Bittner, Bertha Ehard, and Dorothy Kester (library board president). From Illinois Digital Archives. 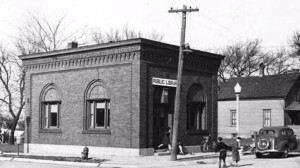 The first Library building was built at 14 E. Busse Avenue on land purchased with money donated by organizations and from individual gifts. 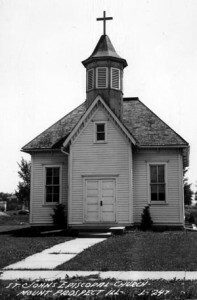 This building was torn down to make way for Village Hall in 2002. 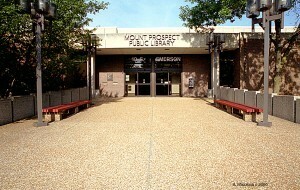 Library expansion completed in 1962. Corner view shows doors on both Busse and Emerson Streets. From Illinois Digital Archives. View of center of main room just east of reference desk. Stairs in background lead to Children’s Room. From Illinois Digital Archives. 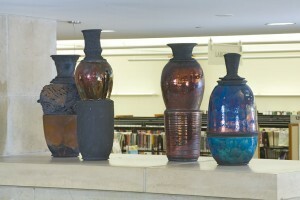 A bond issue of $198,000 authorized an addition to the Library. 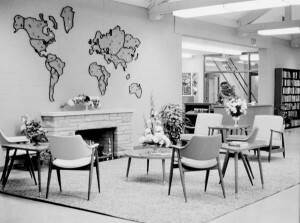 Between 1962 and 1965 two additions were made to the building, tripling the floor space. The collection consisted of about 20,000 books. 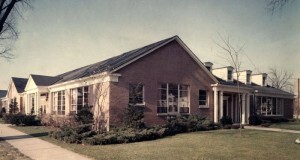 A new Library opened its doors December 6, 1976 on the site of the old Central School. The automated circulation system also went online. 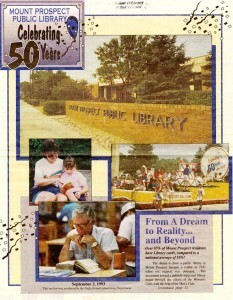 As the Library celebrated its 50th anniversary, many new services became available to patrons, including Readers’ Advisory, a drive-up book drop, and the Internet. Circulation and usage increased as well. A $20.5 million referendum was approved and plans for a renovated library building were drawn up. 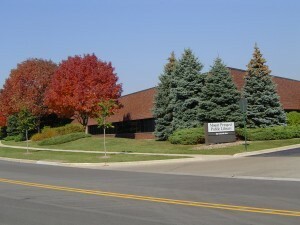 The Library moved to temporary quarters at 852 Feehanville Drive in the Kensington Business Center. 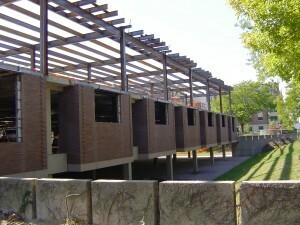 Construction of the library building on Emerson Street was completed. The Library moved back to its permanent home in August. It opened to the public in September. Two commissioned artworks were purchased and placed: the Youth Duck Bench and four pieces of Raku pottery. Annual circulation hit one million for the first time. The first permanent offsite location, known as the South Branch, opened in the Community Connections Center. 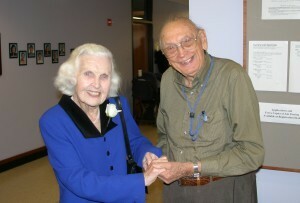 Harold Weary with Mary Jo Hutchings at the dedication of the current Library building. Centenarian Harold Weary was given the Founders’ Award by the Library Board for his contribution of over 40 years of volunteer work and Jackie Hinaber was honored as Illinois Library Association Trustee of the Year.